December 28, 2017 – AccuWeather reports while a powerful nor’easter is not anticipated, a storm will bring enough snow to make roads slippery and coat the landscape in parts of the Northeast with fresh snow before New Year’s Eve. A storm from Montana producing feet of snow will race eastward in the frigid air now entrenched in the northeastern United States. While the storm will struggle to find moisture because of its fast pace in the Eastern states, even a small amount of moisture can squeeze out a small accumulation. The snow will be very fluffy. A mere 0.10 of an inch of water may yield 2 inches of snow. A general coating to an inch or two of snow is forecast from the central Appalachians to the upper mid-Atlantic and southern New England coasts. 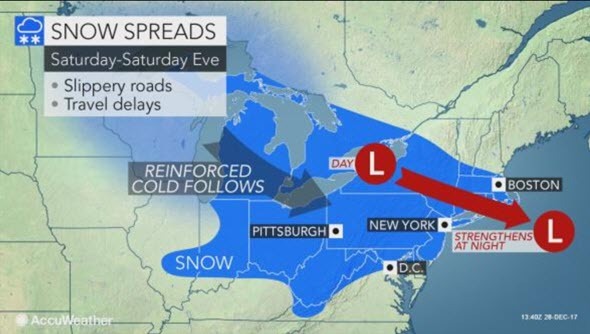 Motorists should anticipate slippery conditions along portions of the Pennsylvania, New Jersey, Connecticut and Massachusetts turnpikes, as well as Interstates 68, 70, 78, 80, 81, 84, 87, 88 and 95. Initially, slight melting of the snow on the roads may occur due to traffic. However, the formation of some ice is likely due to the frigid air before, during and after the storm. Minor airline delays are likely due to deicing operations at many of the major hubs. Timing for the snow from this particular storm is late Friday night to Saturday over the central Appalachians. The snow will fall during the day Saturday along the mid-Atlantic coast and Saturday night in southeastern New England. Areas that stand a greater chance of receiving more than 2 inches of snow include the western parts of Pennsylvania and New York state. However, a secondary area of 2- to 4-inch snowfall is possible in southeastern New England and perhaps Long Island, New York. In this area, the storm may strengthen and grab moisture from the Atlantic at the last minute. Snow showers may occur as far to the south as Washington, D.C., while accumulating snow from the storm may bypass much of northern New England. Any snow that falls from the storm around New York City is likely to stick around through New Year’s Eve as temperatures again plummet in the wake of the storm. Revelers will face dangerously low AccuWeather RealFeel® temperatures below zero F.
Preceding this storm will be a batch of snow that extends from the Midwest to the central Appalachians on Friday. Winds will kick up in the wake of the storm from Saturday and Saturday night. Aside from areas prone to lake-effect snow, most of the time will be free of snow, ice and rain for the latter part of the New Year’s Day weekend. “A persistent northwest flow aloft will prevent storms from moving up from the Southern states from Sunday to [next] Tuesday.